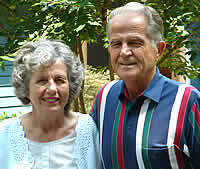 Geraldine Keener (“Jeri”) Crow and Judson O. (“Bud”) Crow. To begin, they purchased a reel of microfilm containing Rutherford County’s 1910 Federal Census. On the reel the information is grouped by township. Within each township the data are grouped by voting precincts. They focused only on the Cliffside precinct. Each frame for that precinct contains a page from the original book in which the census taker recorded—in 1910, in her own handwriting—details of Cliffside’s 2,118 citizens. 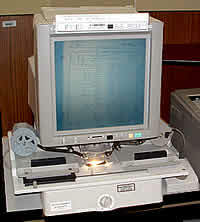 One of the many types of microfilm readers. Microfilm is not much good without a “reader” or projector to view the 35mm film. So the Crows bought a reader, set it up in their home, and over the next decade studied and transcribed the film frame by frame. Each frame (or page) of film contains the data for dozens of people. 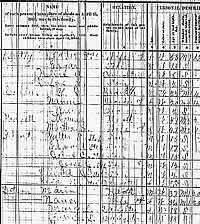 A sample of a frame showing a page from the Cliffside 1910 census. As you can tell from the sample, it can be a much more difficult process than simply copying what you see, for, in many cases, it’s hard to tell what you’re seeing. Naturally you have to decipher the handwriting, which, with Miss Melton’s fairly readable hand, wasn’t all that difficult. But a major problem was the condition of the film. They were plagued by film scratches, focus problems, the aging of the paper itself, etc. Nonetheless, the Crows spent hundreds of hours, interspersed with their other research projects and family life, peering at the reader screen—deciphering, interpreting, confirming. Finally, in 1991 they had it all down, in a computer spreadsheet where they could sort, analyze, graph and print the material. There is considerably more information in the book about each individual than is included in this online version. The book includes the following additional data fields (which may or may not have been filled in by the enumerator). The book lists the households by visitation order, whereas this online version is in house number order. With the book, for those households with missing address elements, you can, with some degree of accuracy, place them in proximity to known addresses by following the enumerator’s path of visitation. You might, for example, deduce that you grandpa probably lived in a particular house on a particular street, even though the enumerator didn’t record the full address. Are the Crows planning a book on the 1920 census? Not likely, they say. The handwriting for the Cliffside precinct that year is practically unreadable. If you’d like to consult the book, contact your local library, they may have a copy.